CELEBRATE 50 YEARS OF LOVE ON CHINCOTEAGUE ISLAND!!!! 2019 marks the 50th anniversary of the “Virginia Is For Lovers” brand and Virginia Tourism Corporation is celebrating with a “50 Years of Love” campaign focused on special experiences across the state through local activations like events, programs and special offerings – that will last 50 days. 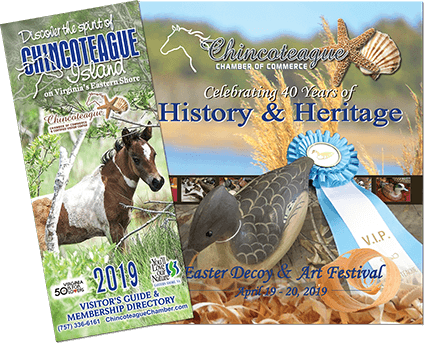 Chincoteague will be celebrating this great milestone with events, activities and promotions that will take place from June 21 to August 10...so come celebrate with us on Virginia’s only resort island! Chincoteague is the perfect getaway that is close to home, yet miles away from ordinary. In addition to all the great celebrations hosted by the chamber and our business community below, there is plenty to do during your visit. Explore the Chincoteague National Wildlife Refuge on miles of hiking and biking trails, kayak its pristine waters to see amazing wildlife; including the world famous Chincoteague Ponies or take in the breathtaking views from atop the Assateague Lighthouse. Relax with your toes in the sand or hit the water and surf the Atlantic Ocean waves at Assateague Island National Seashore. Feel the wind in your hair on a boat cruise or sailing adventure. Cast a rod and catch the ‘Big One’ on an inland or off-shore fishing charter. Discover our rich history by visiting our museums or taking an island history tour or ecotour. Partake in delectable seafood and local fare from one of our many charming restaurants or eateries. Come celebrate 50 Years of Love with us! Check out the island’s schedule of events to make your visit complete. Learn more about 50 Years of Love with the Chincoteague Chamber of Commerce 50 Years of Love Press Release. for our 50 Years of Love celebration on Chincoteague to make your visit most memorable. Take a selfie outside the BEST WESTERN CHINCOTEAGUE with their 1969 Volkswagen bus stand-up complete with CI ponies! Stop by BLUE CRAB TREASURES to purchase your commemorative Pony Love Shirts featuring the Chincoteague Chamber of Commerce LOVE chairs, Chincoteague Ponies Rainbow Warrior, Rumor Has It, Pixie Dust and Ace and 50 Years of Love logo. CHINCOTEAGUE ISLAND HOUSE OF JERKY will be partnering with Beach Road Roundup to offer 10% off your purchase with receipt from each other's business. Chincoteague Island House of Jerky will also be giving away a free burlap bag with every purchase of $50 and selling shirts incorporating the 50 Years of Love logo. Stay at COMFORT SUITES during the 50 Days Of Love and receive a coupon for $50 off a future visit. DOCKSIDE PROPERTIES is proud to participate in Virginia Tourism Corporation's celebration of "50 Years of Love, Virginia Is For Lovers". Beginning June 21, Dockside Properties will be giving away one mystery item a day for 50 days! Challenge your knowledge of the island and learn along the way with the HISTORIC MAIN STREET MERCHANTS '50 Things To Do On Chincoteague' Scavenger Hunt. More information to follow. Share your Chincoteague love story with KEY WEST COTTAGES ON THE CHINCOTEAGUE BAY for a chance to win a two night stay, dinner for 2, a bottle of wine and flowers. Entries must be received on their Facebook page from June 21 - Aug 10 during the 50 Days of Love. Drawing will be held August 11th. Share your special Chincoteague moments for a chance to win! A few sentences, pictures or a paragraph will qualify, but remember to like and follow us on Facebook. Learn all about the world famous pony Misty and her foal Stormy at the MUSEUM OF CHINCOTEAGUE ISLAND's '50 Ways to Love Misty' exhibit featuring Misty, Stormy, books, Breyer horse models and so much more. Promote 50 Years of Love and bring guests to your business! 50 Years of Love Video - can be placed on your website or social media pages - COMING SOON! Virginia Tourism Partner Assets - includes campaign standards, banner ads, images - COMING SOON!